A significant decline in the number of experienced construction workers is wrecking the construction industry at a time when there is an increased need for higher output. BathMasters founder Greg Norman notes the critical need for construction workers to stay healthy and remain in the field for as long as possible so they can teach the next generation the tools of the trade. Greg Norman, Founder of BathMasters, talks about the rising age of the construction industry and the importance of training for the younger generation. The resurgence of the construction industry is reliant upon experienced contractors remaining healthy, and teaching the next generation of construction workers the ins and outs of the field. The National Association of Home Builders estimates that in the United States, there are currently approximately 200,000 construction job openings waiting to be filled, which is an 81% increase over the past two years.1 BathMasters founder Greg Norman sees first-hand how this labor shortage is plaguing the construction industry. Another issue plaguing the construction industry is the dangers faced by workers. At least 10% of workers leave the industry due to injury or illness.3 As a result of constant handling of materials, the need for awkward postures, and the highly physical demands of such work, construction workers may also develop musculoskeletal disorders such as painful shoulder or lower back problems.3 These types of conditions and health issues only contribute to the growing number of workers leaving the construction field.3 When taking into consideration the age of the workers, as well as the potential for illness and injury, it becomes clear that the lack of experienced professionals in the construction world has reached epidemic proportions. 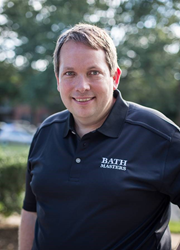 BathMasters is a Virginia plumbing, electrical and building contractor company with showrooms and warehouses in Northern Virginia and the Tampa Bay Area (Florida). BathMasters is rapidly expanding to meet the demand of its customers for high-quality, full-service bathroom renovations and tub-to-shower conversions built to stand the test of time. With thousands of custom bathroom remodel jobs under its belt, BathMasters has become the premier choice for all bathroom renovation needs. Co-founders and brothers Gregory and David Norman grew up in a family of masters: their father was a Master Plumber, and their uncles worked as a Master Electrician, a Master Carpenter, and a Class A Home Builder. The Norman family legacy has always been about high-quality work, never cutting corners, and an unparalleled commitment to communication, honesty and integrity in their dealings with homeowners. It is this legacy that Gregory and David carry forward at BathMasters. Their mission is to improve the skill level of bathroom installers through their extensive workforce training programs, to the benefit of homeowners and the industry itself. Visit BathMastersVirginia.com and BathMastersFlorida.com. 1Reuters. “A Construction Worker Shortage Is Weighing on a Hot U.S. Housing Market.” A Construction Worker Shortage Weighs on a Hot U.S. Housing Market | Fortune.com. Fortune, 06 Sept. 2016. Web. 07 May 2017. 2”Industry Employment and Output Projections to 2024: Monthly Labor Review.” U.S. Bureau of Labor Statistics. U.S. Bureau of Labor Statistics, Dec. 2015. Web. 05 May 2017. 3Laura WelchMar. “The Aging Worker in the U.S. Construction Industry.” Occupational Health & Safety. N.p., 01 Mar. 2010. Web. 05 May 2017.